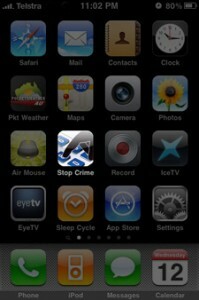 National Capital Area Crime Stoppers is pleased to endorse the new application for the iPhone called “Tip Submit”. You can submit secure and anonymous tips to National Capital Area Crime Stoppers or any Crime Stoppers in Canada. Tipsters could receive rewards of up to $2,000 for information submitted to National Capital Area Crime Stoppers and nobody will ever know your identity. This new application augments the currently existing methods of phone, web, and SMS Text-a-Tip. Enjoy the convenience of communicating with law enforcement via your mobile device while having much more functionality available to you than SMS Text-a-Tip offers alone. No short code or keywords required. Auto-locate the nearest agency that you can submit to or select an agency manually. Include images and video with your tips and have fully anonymous two-way dialogue and real-time chat with the receiving agency.